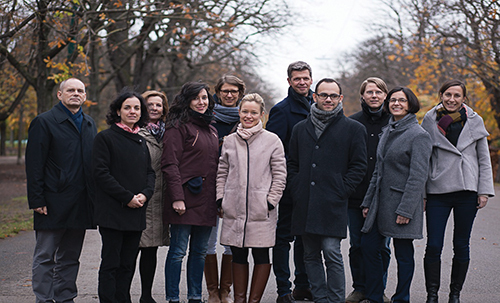 MBA in Europe student Nora Pötter (center, in light-toned coat) and her 12-person staff at Dr. Raab & Dr. Böhm Artists Management handle the details for classical musicians in Austria and beyond. The tempo of Nora Pötter’s life is decidedly prestissimo. As managing director of Dr. Raab & Dr. Böhm Artists Management, Austria’s largest classical music representation agency, Pötter leads a staff of 12, guides the careers of maestros and virtuosos, travels for business four days a week, practices Russian during her six weekly jogs and plays the violin at every opportunity. All of this activity makes study challenging, but it’s also one of the reasons that the 35-year-old German native is enrolled in Cal Lutheran’s MBA in Europe. The program’s key demographic is working professionals from central and eastern Europe who want to receive an American MBA while keeping up with the demands of their careers. “My business is international, so I wanted to understand how people from different parts of the world approach things,” said Pötter, who expects to graduate in May 2018. She took over the artists management agency in 2013 from the then-90-year-old Böhm, who for four decades had burnished its reputation along with the founder, Raab. The agency represents big-name musicians, including Mirga Gražinyte-Tyla, a frequent and acclaimed guest conductor for the Los Angeles Philharmonic. Since childhood, Pötter has been surrounded by the sound of music. Born in Münster, she picked up the violin at age 4 and started the piano a year later. Although her family members were mostly doctors, her parents were keen on education in music. When she was 12, they moved to Vienna, billed as the music capital of the world, and fresh opportunities presented themselves. “I like playing music with other people and all of a sudden the possibility to do it as a profession opened up. In a small town in Germany, that was not on my mind,” she said. To win acceptance into the Vienna Music University, she woke up daily at 5 a.m. to practice the violin for two hours. Once admitted, she continued to study the violin but added French and music education, which turned out to be practical. “A musician’s life can be hard, and if you are not the best of the best and very lucky, it’s better to find a way to combine music with another way to earn a living,” said Pötter, who is married to Russian-born Innokenti Grabko, a viola player for the Vienna Philharmonic. After graduation, she honed her project management skills by putting on cultural exchanges for youth throughout the European Union. In 2006, Raab & Böhm hired her to organize and accompany orchestral tours. Crisscrossing Europe with elite artists may sound glamorous, but did not leave time for sightseeing. Teri Thompson, a former broadcast executive who teaches marketing management in the European MBA program, has seen Pötter’s energy and efficiency at work in the classroom. “I was impressed with her drive, her thirst for knowledge and her ability to organize her own career and that of her clients, who range in age from their 90s to their late 20s,” said Thompson, a CLU adjunct professor and co-author of The Power of Real-Time Social Media Marketing. After a few years at the agency’s helm, Pötter decided she wanted to up her game in business management. She spotted a newspaper ad for the Cal Lutheran program in Graz, Austria, and decided an English-language program taught by U.S. professors would broaden her mind. That’s already happening. She now realizes the value of an onboarding process for new employees. Although she hasn’t become a tech expert and has no desire to do so, what she learned at CLU allows her to ask better questions of her IT person. “When [students] can apply what they learn directly to their work, they grow in self-confidence,” says Thompson, who has been an instructor on the ground in Austria for six years. Most importantly, Pötter believes what she is learning will help her keep up with the relentless drumbeat of change. The degree program in Austria, formally known as the MBA for Experienced Professionals (Europe), is now delivered in Vienna, Graz and Linz. Colleen Cason is an award-winning journalist and longtime columnist for the Ventura County Star. A Thousand Oaks resident, she has served as adviser to The Echo student newspaper and now edits Central Coast Farm & Ranch magazine.